The Art Gallery of New South Wales is delighted to announce it has reached, and surpassed, its $100 million Capital Campaign target to support construction of a new building designed by Pritzker Prize-winning architects, SANAA, as part of the Gallery’s expansion, the Sydney Modern Project. Together with the NSW Government’s $244 million in funding, the $103.5 million raised from donors represents the largest public-private partnership of its kind to be successfully achieved in the Australian arts. The Gallery will continue to seek philanthropic support for its transformation including enhancements and modifications to the existing building, as well as launching an art acquisitions campaign next year. The new building will provide much-needed capacity – close to double current exhibition space – to display more of the Gallery’s outstanding art collection, which belongs to the people of NSW, and host more of the best exhibitions from around the world, increasing visitation to an estimated two million people annually, including 200,000 students and teachers. Announcing the significant fundraising milestone, Art Gallery of NSW director Dr Michael Brand said, “The Gallery set an ambitious target for an ambitious project with art at its heart. The response to the campaign from donors has been so positive that we have surpassed our $100 million goal. This is an extraordinary public endorsement of our vision, and we are incredibly grateful to all our donors for partnering with the Gallery and the NSW Government to help bring this expansion and transformation to life. “I would particularly like to thank our trustees for their generous support of the Sydney Modern Project, and Gallery Board president David Gonski and Campaign Committee chair, Mark Nelson, for their inspired leadership of the campaign,” Dr Brand added. The NSW Minister for the Arts, the Hon. Don Harwin said, “In NSW we are so fortunate to have passionate people in our community who not only have a genuine love for the arts but are also extraordinarily generous. “When we open the doors to the expanded Gallery it will be in large part thanks to the generosity of these people who care so much about this remarkable NSW institution,” Minister Harwin said. Isaac Wakil AO and the late Susan Wakil AO, whose $20 million gift in June 2017 was the largest monetary donation in the Gallery’s history. The Susan & Isaac Wakil Foundation has since made an additional gift of $4 million to the campaign. 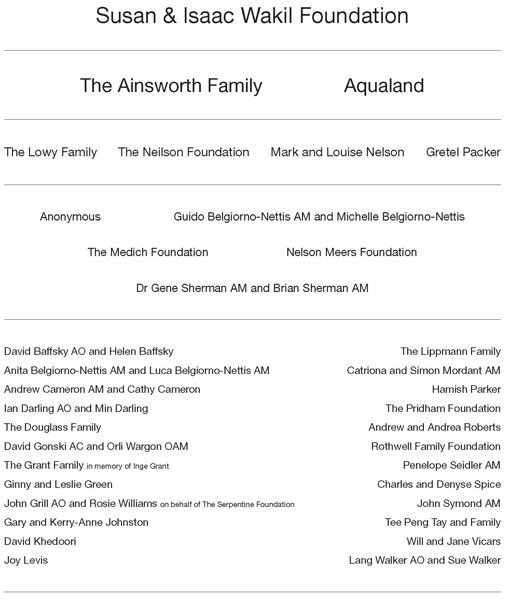 The Ainsworth family and Aqualand, who have made gifts of $10 million or more. The Lowy family, The Neilson Foundation, Mark and Louise Nelson, and Gretel Packer who have made gifts of $5 million. Guido Belgiorno-Nettis AM and Michelle Belgiorno-Nettis, The Medich Foundation, Nelson Meers Foundation, and Dr Gene Sherman AM and Brian Sherman AM who have made gifts of more than $1 million. The campaign’s Founding donors, including Building Founders and Yiribana Founders, who have each made gifts of $1 million. A listing of the campaign’s lead donors and major supporters is included below. The Gallery is also grateful to participants in the Visionary Donor and Asia Pacific Patron programs, who are supporting the campaign with gifts of at least $100,000, and to those donors who have chosen to remain anonymous. The Gallery is looking forward to encouraging participation by all Gallery enthusiasts as part of the next phases of the campaign. Art Gallery of NSW trustee Geoff Ainsworth, whose family made a leadership gift to the Capital Campaign, said a passion for art and its ability to inspire, educate and move us all was a key motivator for their significant support. “We are delighted to support this exciting new chapter in the Gallery’s history. Sydney will gain a vibrant new cultural destination where audiences can see more of the State’s outstanding art collection and more of the best exhibitions from around the world,” he said. Mr Ainsworth is also a leadership donor, together with his wife Johanna Featherstone, to the Gallery’s art acquisition campaign, which will be officially launched next year in the lead up to the Gallery’s 150th anniversary in 2021. An important focus of that campaign will be site-specific works commissioned from leading Australian and international artists. The campaign announcement follows this week’s approval of the Gallery’s State Significant Development Application for the Sydney Modern Project by the NSW Minister for Planning. Construction of the Gallery’s new building is expected to commence in early 2019 for completion in 2021. Highlights of the expanded Gallery will include a prominent destination for Aboriginal and Torres Strait Islander art; a large gallery for major exhibitions; a spectacular contemporary art space repurposed from a decommissioned WWII oil tank, and spaces for educational programming to double student and teacher visits to 200,000 annually. Visitors to the Gallery, Domain and adjacent Royal Botanic Garden will enjoy a public Art Garden connecting the new stand-alone building and the much-loved historic building. The building’s design maximises and enhances open space as well as public amenity across the site and is the first art museum in the nation to achieve the highest environmental standard with a 6-star Green Star design rating. Thank you to these leadership donors and major supporters for their generous gifts to the Capital Campaign to support the Gallery’s expansion, the Sydney Modern Project. *Featuring artworks left to right: Reko Rennie, Murri Totems, 2013 © Reko Rennie, courtesy of the artist and Blackartprojects; Clement Meadmore, Flippant Fury, 1977-1978 © Clement Meadmore/ARS. Licensed by Copyright Agency; William Tucker, Prometheus (for Franz Kafka), 1989-1990 © William Tucker.